Certificate of Honor - "He Lives"
This certificate is free to download and print for your church members. Every church needs to honor their members at special events. You can show your appreciation in this special way and acknowledge them. 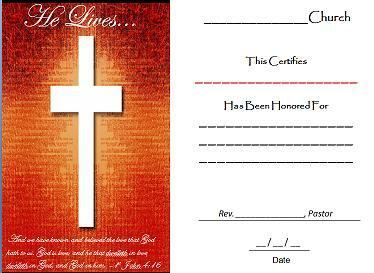 This certificate can be used for Sunday School promotions, Baptism, Communion, and other church events to honor your church members. You can honor memorable moments at church with this certificate and present them with a quality, long lasting certificate that they can preserve as a keepsake for years to come. The certificate below "He Lives" has the scripture of 1 John 4:16 below the cross stating "And we have known and believed the love that God hath to us. God is love; and he that dwelleth in love dwelleth in God, and God in him." The certificate can be printed on many different forms of paper such as resume, stock or even plain copy paper depending on your preference and which color of paper you prefer on this particular certificate. The certificate can also be inserted into different items to help preserve this memento such as a beautiful picture frame or even simply a sheet protector depending on how you want to present it to your church members. If you have been surfing the web, you already know that most websites charge for their certificates, but I'm creating these certificates to help small to medium-sized churches who cannot afford to purchase a certificate every time they would need one for a certain church event. I will be adding more certificates as time permits so keep in touch through my free monthly newsletter "The Form Gallery" or through my FreeChurchForms.com Blog to receive any new certificates, forms, etc. as they become available. Return to Certificates Page from Certificate of Honor.